Wally Berg reporting. We left for Khunde at about 8:30 AM. Our first stop was the Khumjung Monastery. Ang Temba took us inside and after we stood quietly and admired the beautiful art and the peaceful coolness of the inside, we took a look at the famous “Yeti Scalp” that has been kept at this monastery for decades. 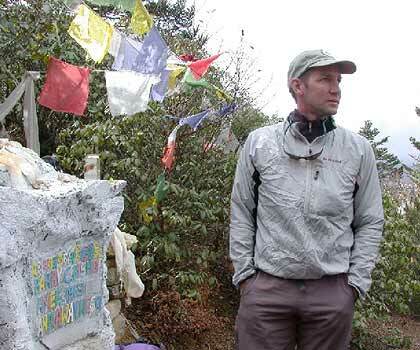 The story goes that the Scalp came from a Yeti that was found near Nangpa La on the Tibet border. 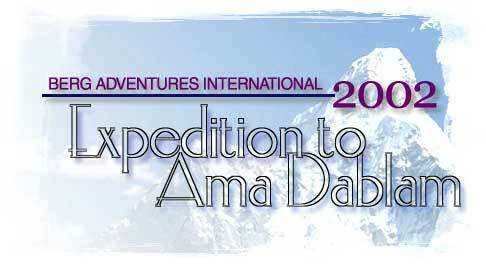 During our expedition this month we will be referring frequently to the first ascent of Ama Dablam, which was done by Barry Bishop and others in March of 1961. Barry’s team managed the first ascent of the same route that we will attempt as a part of their research, exploratory and climbing projects on the 1960  1961 Himalayan Scientific and Mountaineering Expedition. Sir Edmund Hillary was the leader of the expedition. One of my favorite things about the team, which was comprised of scientists as well as mountaineers was that Marlin Perkins (yes, the same Marlin Perkins we all remember from Mutual of Omaha’s Wild Kingdom) was along. I have a photo taken by Barry of Marlin wearing the same Yeti Scalp from Khumjung from the October 1961 National Geographic. These days the Yeti Scalp is kept in a locked glass case, so we were on able to try in on for size as Perkins did so many years ago. We had a few quiet moments with “the boys”, before we moved on from Tangboche to Pangboche, where we will be staying at the lodge of Ang Temba and his wife Yangjing. 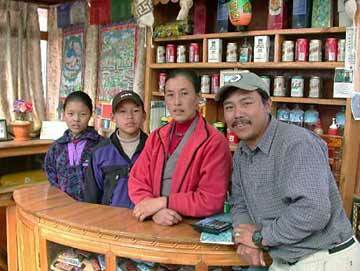 Their two children, Tshering and Denzan Yangtee are home from school for the Nepalese Dasain Holiday period. As many of you know Ang Temba will be the Sirdar or head Sherpa for organizing and running the Berg Adventures Everest 2003 climb next spring. When we get to Pangboche we will also hook up with Nima Tashi, who will be busy getting our Base Camp for this season’s Ama Dablam climb established.